Aim To investigate the relationship between recurrence of uveitis and timing of infliximab in patients with Behçet's disease. Methods Charts were retrospectively reviewed for 23 patients with refractory uveoretinitis associated with Behçet's disease treated using infliximab at our hospital. Infliximab was administered by intravenous infusion at weeks 0, 2 and 6, and every 8 weeks thereafter. The relationship between recurrence of uveitis and infliximab infusion was analysed. Results Mean duration of infliximab treatment for the 23 patients was 20 months, and the mean number of infliximab infusions was 12. Recurrent uveitis was seen during treatment in 13 of 23 patients, with no recurrences in the remaining 10 patients. Two patients developed recurrence soon after starting treatment—for example, first recurrence after starting infliximab was on day 19 or day 29, but the other 11 patients experienced recurrences after 5–6 months of infliximab treatment. As regards the timing of recurrences following infliximab infusion, 10 of the 13 patients developed recurrences ∼5 weeks after infliximab infusion. Recurrent uveitis in these patients most often occurred during weeks 7–8 after infusion. However, three of the patients developed recurrent uveitis at various times, for example in weeks 1, 4, 7 and 8 after infliximab infusion. Conclusion Infliximab is effective for suppressing recurrence of uveitis in Behçet's disease, but responses to infliximab differ among patients. Careful observation following infliximab infusion is necessary to manage the recurrence of uveitis during treatment. Recent advances in immunology have enabled the application of various biological agents, including cytokines and monoclonal antibodies.9–11 Among these biological agents, a chimeric monoclonal antibody to tumour necrosis factor α (TNFα), infliximab, has been used to treat patients with rheumatoid arthritis12 13 and Crohn's disease14 in many countries, with marked efficacy. In the eye, the efficacy of infliximab treatment against non-infectious uveitis has been reported in many countries.15–23 In Japan, clinical trials of infliximab for refractory uveoretinitis with Behçet's disease have been performed,15 and the agent was approved by the Ministry of Health and Welfare of Japan in January 2007. Since then, >300 patients with Behçet's disease with uveoretinitis have been treated using infliximab in Japan. We have treated 34 patients with Behçet's disease and refractory uveoretinitis over the past 8 years. Our clinical experience with infliximab for Behçet's disease23 has revealed that the treatment is very effective, supporting many previous reports.8 15–22 However, a certain number of patients develop recurrent uveitis even when taking infliximab. When infliximab-treated patients develop recurrent uveitis in relation to infliximab infusion is not well understood. The aim of the present study was, therefore, to analyse the recurrence of uveitis in patients with Behçet's disease receiving infliximab treatment. Such data would show how the efficacy of infliximab changes during treatment, and different patterns of response to infliximab in treated patients. 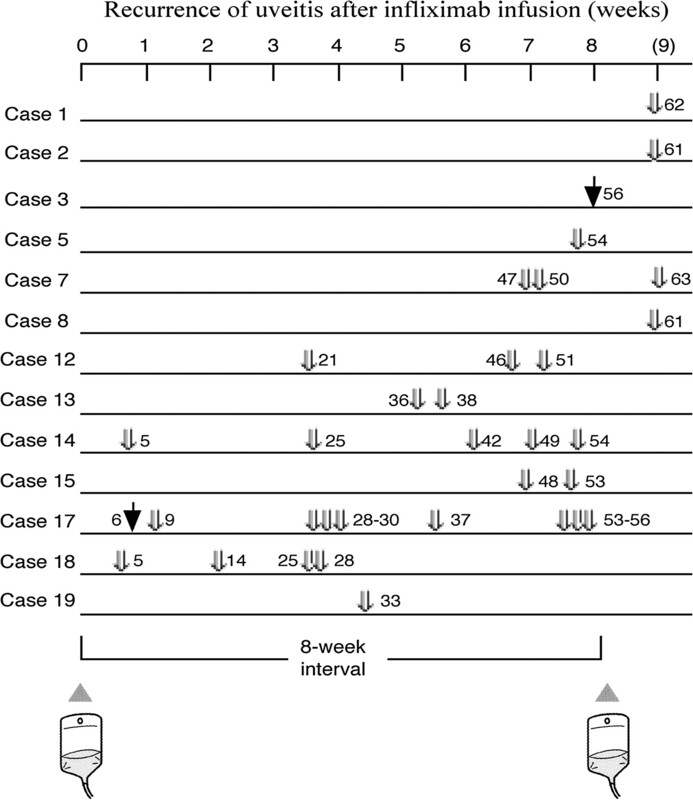 Subjects comprised 23 consecutive patients with Behçet's disease treated using infliximab for ≥6 months at the uveitis clinic of the Tokyo Medical and Dental University Hospital between September 2000 and October 2008. All episodes of recurrent uveitis after infliximab treatment were retrospectively collected from the clinical charts of each patient. Special attention was paid to the following items: (1) when recurrent uveitis occurred in rrelation to the start of infliximab treatment; and (2) the interval between infliximab infusion and recurrence of uveitis. Recurrence of uveitis in this study included all types of uveitis—that is, anterior uveitis, intermediate uveitis, posterior uveitis and panuveitis. Infliximab was administered by intravenous infusion at a dosage of 5 mg/kg in all except for one case in which 10 mg/kg was given due to the protocol of an early phase II clinical trial of the drug. Infliximab infusion was given at day 0, week 2 and week 6, then every 8 weeks thereafter. All patients were converted to infliximab due to the ineffectiveness of previous treatment with various immunosuppressive agents (colchicine, ciclosporin A) with or without systemic corticosteroids. In addition, previous treatments such as colchicine, systemic corticosteroids and ciclosporin A were also converted to infliximab due to their side effects. When infliximab was started, previous treatment with immunosuppressive agents was discontinued and systemic corticosteroids were slowly tapered. This study followed the tenets of the Declaration of Helsinki, and was approved by the ethics committee of Tokyo Medical and Dental University. The mean duration of infliximab treatment for the 23 patients by April 2009 was 20 months (range, 6–43 months). Table 1 shows: (1) the duration of infliximab treatment; (2) the number of recurrences while receiving the treatment; (3) the exact timing of the first recurrence after starting infliximab treatment; and (4) the total number of infliximab infusions for the patient. 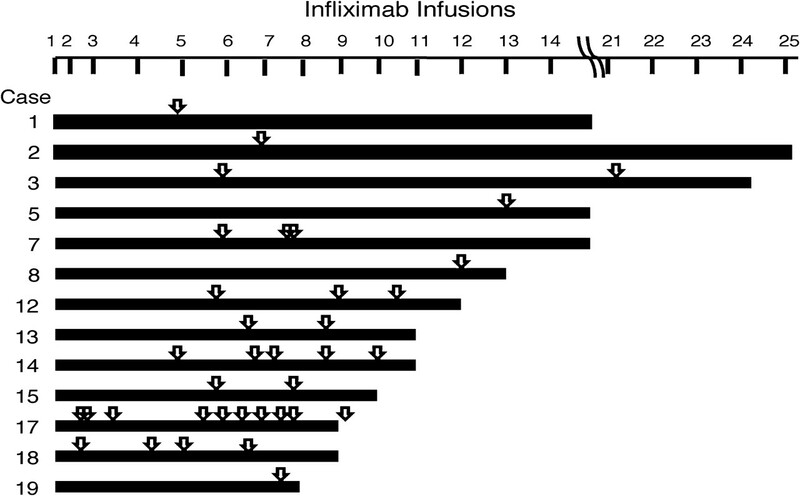 The mean number of infliximab infusions for these patients was 12 (range, 5–25) (table 1). Table 1 also shows treatment before infliximab administration and concomitant treatment with infliximab. Among the 23 patients, 10 patients did not develop any recurrences of uveitis during treatment (table 1). The remaining 13 patients experienced ≥1 episode of recurrent uveitis during treatment (figure 1). Of these 13 patients, two (cases 17 and 18) developed recurrent uveitis soon after treatment started and showed numerous recurrences. For example, the first recurrence after starting infliximab was on day 19 in case 17 and on day 29 in case 18. The remaining 11 patients showed no recurrences in the first 5 months of treatment. The majority of these patients started developing attacks of uveitis at ∼6 months after starting infliximab treatment, when the infusion protocol was changed to an interval of every 8 weeks from a shorter interval according to the treatment protocol for infliximab (figure 1). Recurrences of uveitis throughout follow-up. Recurrence of uveitis was seen in 13 of 23 patients during the follow-up period. Two patients (cases 17 and 18) developed recurrence of uveitis soon after treatment started, while the remaining patients developed recurrence after 5–6 months of infliximab treatment. Arrows (open) indicate uveitis attacks and arrowheads (black) indicate infliximab infusion. The interval between infliximab infusion and the recurrent episode of uveitis following infusion in the 13 patients is summarised in figure 2. From the perspective of the timing of recurrent uveitis following infliximab infusion, the 13 patients could be classified into two groups. One group (cases 14, 17 and 18) developed recurrent uveitis at various times after infliximab infusion. For example, the three patients developed recurrent uveitis in weeks 1, 4, 7 and 8 after infliximab infusion (figure 2). Interval between scheduled infusion and recurrence of uveitis. The infusion interval was basically every 8 weeks. For each infusion interval, the timing of recurrent uveitis from the last infliximab infusion was analysed. In most patients, recurrence occurred 7–8 weeks after the last infusion. Three patients developed recurrence of uveitis randomly, and cases 17 and 18 developed uveitis soon after starting infliximab treatment. Some patients did not receive infusion on the scheduled day for various reasons (eg, cancelled treatment due to sickness). These patients therefore received the infusion in week 9. Open arrows indicate the occurrence of uveitis. Black arrows indicate the occurrence of uveitis in both eyes. Numbers in the graph indicate the exact timing of the recurrence after starting treatment in the 8 week infusion interval (mean±SD=38.4±18.5 days). We collected the data for scheduled infusion (8 week interval). The other group developed recurrences at or after ∼5 weeks after infliximab infusion. In this group, recurrent uveitis most often occurred 7 or 8 weeks after infusion, just before the next infusion of infliximab was due. In some patients (cases 7, 12 and 13), we shortened the interval between infliximab infusions from 8 weeks to every 6 or 7 weeks, and none of these patients experienced uveitis attacks after this change. The present findings show that infliximab treatment was effective in suppressing the activities of ocular inflammation in Behçet's disease. However, approximately half of our patients developed recurrent episodes of uveitis after ∼6 months of infliximab treatment. Three interpretations are possible. The first possibility is that rapid discontinuation of previous immunosuppressive agents and systemic corticosteroids caused rebound effects, resulting in recurrence. As previously reported,24 patients should be kept on maintenance doses of concomitant medications to reduce the risk of developing antibodies against infliximab and for better control of inflammation. The second possibility is that changing the infusion interval of infliximab to every 8 weeks after the fourth infusion is too early. The last possibility involves the appearance of neutralising antibody to infliximab, human antichimeric antibody (HACA)/antibodies-to-infliximab (ATI). Which of these represents the most appropriate possibility remains unclear based on the available data. Measurement of infliximab concentrations as well as HACA in the serum will provide direct answers to these questions. These data suggest that when infliximab is started, previous immunosuppressive agents should be tapered carefully or be given concomitantly at lower dosages. This might help to avoid the recurrence of uveitis in the first 5–6 months of infliximab treatment. Concomitant use of other immunosuppressive agents together with infliximab is suggested to prevent the development of HACA. In fact, low-dose methotrexate is given with infliximab in patients with rheumatoid arthritis.13 Measurement of HACA in the serum of our patients will provide direct information on this issue. Measurement using ELISA is known to be affected if infliximab is present in the serum,25 although the measurement of ATI in the serum is important. To clarify whether concomitant immunosuppressive agents are necessary in Behçet's disease, a comparison between patients treated with infliximab monotherapy as in the present study and those treated with infliximab together with other immunosuppressive agents would be helpful. Some patients (cases 14, 17 and 18 in figure 2) were considered unresponsive to infliximab. Although infliximab treatment was not stopped for these patients, ciclosporin and/or prednisolone was actually added as concomitant treatment. These patients responded after adding ciclosporin and/or prednisone, but uveitis attacks were not completely stopped. However, the number of uveitis attacks and disease activity were actually reduced compared with infliximab treatment. Inflammatory cytokines other than TNFα were considered to be related to disease activity in these patients. If such patients had developed severe side effects such as infection, we would have considered stopping infliximab and changing to other immunosuppressive treatments. In conclusion, infliximab is effective for suppressing recurrent uveitis in Behçet's disease, but responses to infliximab differ among patients. Careful observation following infliximab infusion is necessary to manage the recurrence of uveitis during treatment.
. Behçet's disease. Semin Arthritis Rheum 1998;27:197–217.
. Behçet's disease. N Engl J Med 1999;341:1284–91. International Study Group for Behçet's disease. Criteria for diagnosis of Behcet's disease. Lancet 1990;335:1078–80.
. Close association of HLA-Bw51 with Behçet's disease. Arch Ophthalmol 1982;100:1455–8.
. Behçet's disease, the silk road and HLA-B51: historical and geographical perspectives. Tissue Antigens 1999;54:213–20.
. EULAR recommendations for the management of Behçet's disease. Ann Rheum Dis 2008;67:1656–62.
. Treatment of Behçet's disease—an update. Semin Arthritis Rheum 2001;30:299–312.
. Infliximab effects compared to conventional therapy in the management of retinal vasculitis in Behçet's disease. Am J Ophthalmol 2008;146:845–50.
. Biologic therapies for inflammatory eye disease. Clin Exp Ophthalmol 2006;34:365–74.
. The use of interferon α in Behcet disease: review of the literature. Semin Arthritis Rheum 2004;33:320–35.
. Tumor necrosis factor antagonist—preliminary evidence for an emerging approach in the treatment of ocular inflammation. Retina 2007;27:399–413.
. Repeated therapy with monoclonal antibody to tumor necrosis factor alpha in patients with rheumatoid arthritis. Lancet 1994;344:1125–7.
. Infliximab (chimeric anti-tumour necrosis factor alpha monoclonal antibody) versus placebo in rheumatoid arthritis patients receiving concomitant methotrexate: a randomized phase III trial. Lancet 1999;354:1932–9.
. Efficacy, safety, and pharmacokinetics of multiple administration of infliximab in Behçet's disease with refractory uveoretinitis. J Rheumatol 2004;31:1362–8.
. Effect of infliximab on sight-threatening panuveitis in Behçet's disease. Lancet 2001;358:295–6.
. Effect of infliximab on threatening panuveitis in Behçet's disease. Lancet 2001;358:1644.
. Infliximab for recurrent, sight-threatening ocular inflammation in adamantiades-Behçet's disease. Ann Intern Med 2004;140:404–6.
. Efficacy of infliximab in the treatment of uveitis that is resistant to treatment with the combination of azathioprine, cyclosporine, and corticosteroids in Behçet's disease. An open label trial. Arthritis Rheum 2005;52:2478–84.
. Infliximab treatment for ocular and extraocular manifestations of Behçet's disease. Jpn J Ophthalmol 2007;51:191–6.
. Long-term efficacy of infliximab in refractory posterior uveitis of Behçet's disease: a 24-month follow-up study. Rheumatology 2007;46:1161–4.
. Safety and efficacy of infliximab therapy in active Behçet's uveitis: an open-label trial. Rheumatol Int 2008;29:53–7.
. Comparison of infliximab versus cyclosporine in the initial 6 months of the treatments in Behçet's disease. Br J Ophthalmol 2010;94:284–8.
. Anti-TNF therapy in the management of Behcet's disease–review and basis for recommendations. Rheumatology (Oxford) 2007;46:736–41.
. Population pharmacokinetic analysis of infliximab in patients with ulcerative colitis. Eur J Clin Pharmacol 2009;65:1121–8.
. Clinical trial: benefits and risks of immunomodulators and maintenance infliximab for IBD-subgroup analyses across four randomized trials. Aliment Pharmacol Ther 2009;30:210–26.
. Incidence and clinical significance of immunogenicity to infliximab in Crohn's disease: a critical systematic review. Inflamm Bowel Dis 2009;15:1264–75. Ethics approval Ethics approval was provided by the Institutional Ethics Committee of Tokyo Medical and Dental University.